Five Olympic golds, seven Track World Championships, one Road World Championship, one European Track Championship, and one Tour de France title. That’s just the first place finishes that adorn the trophy cabinet at Sir Bradley Wiggins’ house. 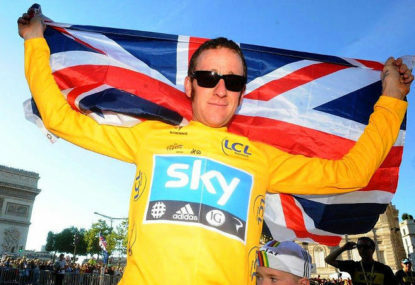 Sir Bradley is a legend, a larger-than-life sportsman who transcends cycling and has captured the hearts and minds of the British sporting public. And, shockingly, Wiggins has recently become a man in the middle of tentative doping insinuations after Fancy Bears, a hacking group which is allegedly Russian, leaked details about how he took a powerful corticosteroid, triamcinolone, before his biggest races of the season in 2011, 2012 and 2013. Wiggins has explained that he has asthma and received permission from the authorities for therapeutic use exemption (TUE) on each of the occasions exposed by Fancy Bears. That explanation is, of course, above reproach. A few questions, however, remain unanswered. Why was a 40mg injection of triamcinolone taken just before the 2012 Tour de France? Wiggins maintains that it was because he “really struggled” with respiratory problems and the drug just levelled the playing field. The two assertions are obviously far from consistent. Perhaps a less damning question is about how the ‘no needles’ rhetoric interspersed through his autobiography reconciles with the fact that he took injections of a powerful drug before some of the toughest races of his life. His explanation for this can probably be taken more at face value, that for him, the term ‘no needles’ referred to doping rather than medication. Even here, he is having to face a few sceptics, who are less generous with their opinions. While British Cycling tries to extricate themselves from this mess, indignantly protesting about this diluting the real doping issues of Russia, the truth is that this is a serious issue which must be addressed at the same time. Can cycling prove that they’re not when faced with such evidence, even if it is circumstantial? In a post-Lance Armstrong world, when cycling is trying to prove its squeaky clean reputation, can they afford this kind of a situation? It’s a real tragedy when a great sportsman like Sir Bradley is just about to ride into the sunset at the pinnacle of his career, only to have these allegations surface. The cycling establishment needs to deal with this in a firm and permanent fashion to settle these allegations once and for all. If they don’t, the Fancy Bears of this world will be right to maintain that people in glass houses should not throw stones.